You must be a member of the Berlin Wine and Food Tasting Group to attend this activity. Would you like to join this group? To celebrate the new year, we will sip 6 different Sparkling Wines, and try to guess which one is the real Champagne!! We have the special opportunity, to spend the evening with some Bubbles, in a Private Member's Club in Kreuzberg -- the last chance to visit this lovely space, as they will move locations at the beginning of March. To add some fun to the evening, we will also ponder some collaborative Peanuts Cartoon questions about life. 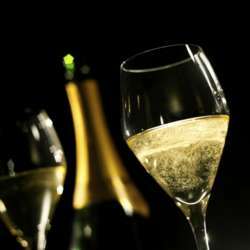 Will you be able to tell the difference between the Spanish Cava and the German Sekt? Will you enjoy the Champagne more than the Italian Prosecco? I hope you can join us to see who can guess the Champagne, where the bubbles come from, and which style is your favorite! NOTE-- Exact location will be given after your payment is received.